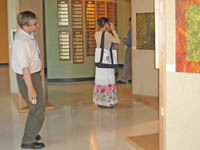 The opening reception and lecture included many people from the community. As we learned from our visits with the Paper Discovery Center (PDC) folks, this is the heart of the paper making industry. So the night was a particularly enjoyable celebration. 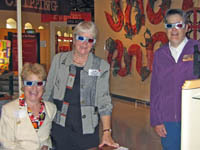 3D glasses were the fashion statement at the opening lecture for the Fiberscapes exhibit. 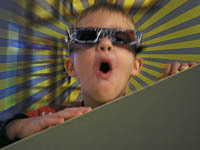 Kids of all ages have fun exploring the pieces and the installation. 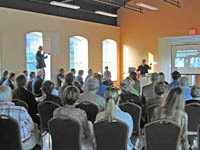 People from all areas of the paper making industry along with community leaders were in attendance for the opening lecture. 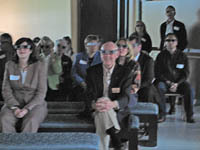 In some cases, leaving standing room only for some guests. 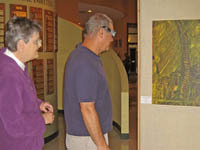 Visitors examine and interact with the 3D canvas and print works. 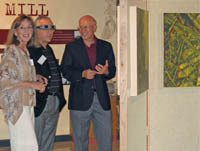 Bob and Roger finally have time to take in the exhibit after their long hours of work on the installation. A big THANK YOU to both of them along with the other staff of the PDC.